Hobbies: Searching for novel adjectives; Overcoming his dislikes one at a time. Things that are important His raging appetite, he can't say the other one. 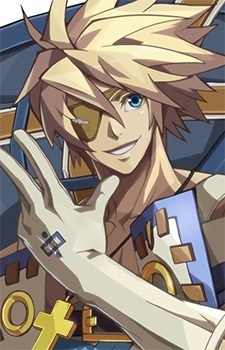 Sin is a major character in Guilty Gear. He is the son of Ky Kiske and The Maiden of the Grove. He travels with Sol Badguy for most of the game. He does not seem to get along with his father very well; however, he appears to have a very deep love for his mother. He has an eye patch over his right eye for unexplained reasons. As a child, he was kept on a chain by Sol, and always carried his favorite stuffed animal Chimaki with him. He is the target of the antagonist Valentine, since his Gear cells allow him to be The Key to open and unlock The Cube. He feels uncomfortable in orderly situations and is not too good at social dispositions. On the contrary, his personality that doesn't look back on what's done may seem insensitive, but his simple and innocent personality can be refreshing. He also has an optimistic and cocky side to him. He also considers his appetite as something important to him, as "he cannot say the other one." Over the past couple of years, he has been traveling with Sol as a bounty hunter and has overcome many hardships. He trusts Sol and looks up to him as a father, a friend, and a teacher. He is currently enjoying his journey.